The Oregon Nordic Club with its twelve chapters offers year-round outdoor activities with an emphasis on Nordic skiing, and is the parent organization for the Willamette Chapter. Xcskiworld.com is mostly oriented towards track skiing and racing, but it still has quite a bit of interesting info and many links to events and training techniques. There are several sites for determining Santiam Pass conditions before you leave for your trip. Club favorites are the Santiam Pass Ski Patrol, Hoodoo Daily Conditions and the Oregon Department of Transportation Road Conditions. Snow-Forecast.com is a global snow depth forecasting service originating from the U.K. The bulk of their data originates from the Nation Weather Service in the U.S., but their interface swiftly reconfigures the raw data into a meaningful visual experience. They do include the conditions for Hoodoo, as well as other Oregon favorites. NOAA (National Oceanic and Atmospheric Administration) posts forecasts for the Santiam Pass region. The first is a map of OR & WA that allows you to click on a location to obtain graphic and text forecasts for a specific location. The second is a text page for northwest OR and southwest Washington through which you must scroll to find the region of interest. The text only version gives more detail on predicted snow level and predicted snowfall. Hoodoo Mountain Resort is the ski resort in the Santiam Pass, and has up-to-date weather information that is useful in planning your trip. SkiTiger is the Northwest ski & snow report, with information on skiing & snowboarding areas, snow conditions, cams, weather, road conditions, and travel. Mt. Hood Meadows posts daily conditions for their resort. The aim of our trips is to have enjoyably challenging experiences along with other skiers on winter backcountry trips. Since there is inherent risk in what we do, it is the responsibility of each of us to participate in a thoughtful and intelligent way, matching the trips we participate in to our skill level, and using each trip as an opportunity to improve our skiing and navigation skills and our ability to assess snow safety conditions. Avalanches occur near Santiam Pass, and it pays to be prepared. For the Santiam region, you will want to visit the Summary Avalanche forecast for the Mt. Hood area, which is the report geographically nearest to Santiam Pass. Always check this resource before your ski tour. If you have any question about the day’s snow safety / avalanche conditions, it is wise to await better conditions. The mountains will always be there. The National Avalanche Center has a wealth of information, and links to the USDA Forest Service Northwest Weather and Avalanche Center. For the Santiam region, you will want to visit the Summary Avalanche forecast for the Mt. Hood area, or check out the links at the Cyberspace Avalanche Center. Maps The Santiam Pass is covered by two National Forests, the Deschutes and the Willamette. 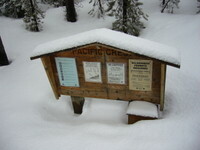 Winter recreation maps are available for the Deschutes, and trail descriptions for the Willamette.